Hello and welcome to my crafty blog! Anywhoo I want to announce the winner of the Blog Candy I offered for comments and tips on repurposed, up-cycled, creative and cheap storage ideas to help me through this temporary 'no place to craft' stage. Thank you for taking part in the Blog Candy competition and your prize will be winging it's way to you first thing next week. 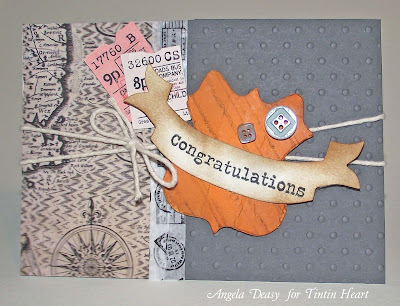 My second post for today is the Cards Galore challenge which started yesterday and the theme is 'One for the men'. Not sure about you but I find it a tad difficult to come up with cards for men of the male persuasion so this DT project was a bit difficult. I had two attempts at this and finally settled on this card for my DT submission. Tim Holtz to the rescue again. and THIS is the prize!!!! So to enter the challenge you need to pop over to the Cards Galore challenge blog and get your 'One for the Boys' project entered and linked to your blog and you have about 25 days to get your project made and submitted. Loads of time !!! Looking forward to seeing your take on our Masculine challenge.